Being stuck in traffic is a normal occurrence at the intersection of I-71 and US 36/SR 37 during the peak hours. ODOT conducted a traffic impact study in 2003 to analyze the high crash rates around the 40-year-old interchange and is now ready to begin construction in 2019. The intersection at I-71 and US 36/SR 37 has been a long-standing issue for motorists who navigate the traffic in the area during peak hours of congestion. 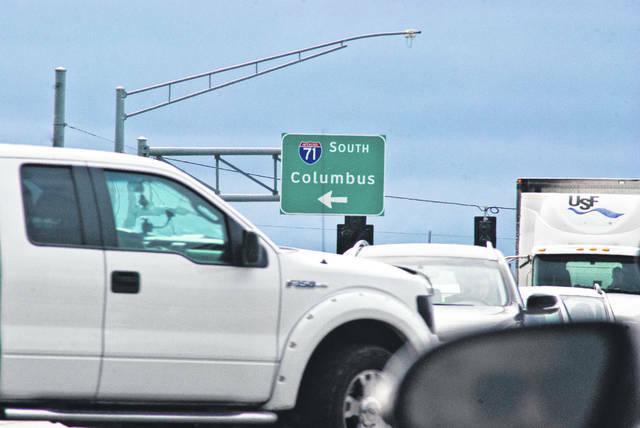 The Interstate 71 and U.S. Route 36/state Route 37 intersection drew the attention of the Ohio Department of Transportation long before New Albany-based Blue Horseshoe Ventures, Ltd. considered building Planet Oasis. Planet Oasis is a multi-billion dollar entertainment venue proposed to be built on more than 350 acres at the intersection of I-71 and US 36/SR 37, across from the Tanger Outlet Mall. Once constructed, the venue would generate approximately 15,000 to 25,000 jobs and hundreds of millions in tax revenue to Delaware County. Construction is scheduled to begin in December 2018 with the opening scheduled for December 2019. Thomas Slack, ODOT 6 Capital Programs administrator, said the recent announcement will not affect the first phase of the planned construction for the troublesome intersection. He said the area around the intersection has been “poised” for development for many years. Driven by issues of safety, ODOT initiated a traffic impact study in 2003 to analyze the high crash rates around the 40-year-old interchange and to recommend modifications to lane configurations at the interchange, while also finding a way to better control the access management to and from US 36/SR 37 onto I-71. From the study, ODOT developed a multi-phase, $162 million improvement plan for the area. Construction is scheduled to start in 2019, and the entire project could take up to 17 years to complete. In a public meeting held in July 2017, ODOT’s Steve Fellenger addressed the public’s concern of the area being under constant construction for 17 years. He said the construction will come in intervals and not as a steady constant. “This project will not be under construction for (a constant) 17 years,” he said. Slack said ODOT intends to break ground in 2019 on the first phase that will carry through into 2021. 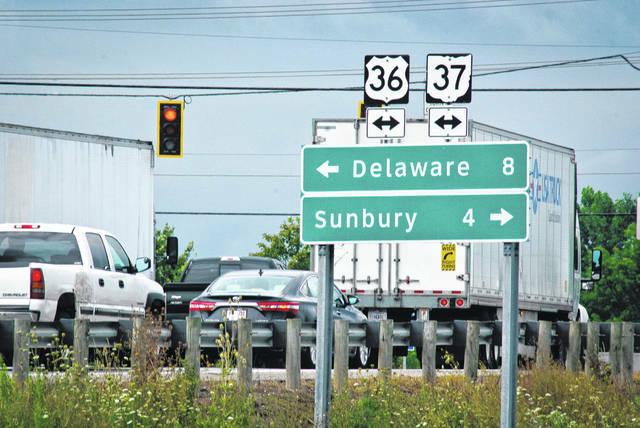 According to ODOT’s plans, the first phase will add a new intersection with a loop south of the I-71, US 36/SR 37 intersection connecting to Wilson Road behind Tanger Outlets. Slack said the Planet Oasis group will put together a traffic impact study to see if something different needs to be added or changed such as turn lanes or traffic lights. He said outside of small changes, the current plan is flexible in timing out when each phase will start. Slack added the first set of discussions with Planet Oasis and the county engineer are a matter of working to set the ground rules and assumptions that will go into the traffic study. He said once completed, the traffic study might indicate that some of the phases might need to be performed earlier than originally thought, while others are delayed longer due to specific developments from the study. Nothing can happen, however, until the study is completed. Slack said they don’t know what to expect in traffic once Planet Oasis is constructed, because there is nothing to compare it to in the area. He said there are many pieces to the development with various types of uses. “How do those different types of uses overlap with the commuter traffic?” he asked. “Which direction is it coming from? There are times at those signals that different lengths of the intersection are bad. Those are the kinds of things that we need to discuss and agree on up front, because there are several steps to the traffic study. Those are the types of things we’ll be talking to them about to get a better understanding,” Slack said. He added the current plan is based on a schedule that was developed before the Planet Oasis announcement was made. “But to get to the bigger goal, ODOT needs details from Planet Oasis,” he said.